Perhaps you have read the story in the bible about Joseph’s coat of many colors? True, it’s no Moses and the Red Sea parting but it’s still kind of famous. There’s a Broadway play that borrowed it. After including some songs, of course. At least, I assume playwriters added the songs. I can’t imagine anyone broke into song and dance in real life but I won’t guarantee it. I wasn’t there. If you listen to old twangy country then you also are familiar with Dolly Parton’s song about her coat of many colors. Be warned, it’s a heart tugger of a story in itself. She calls it her most autobiographical song. I can relate. Sort of. 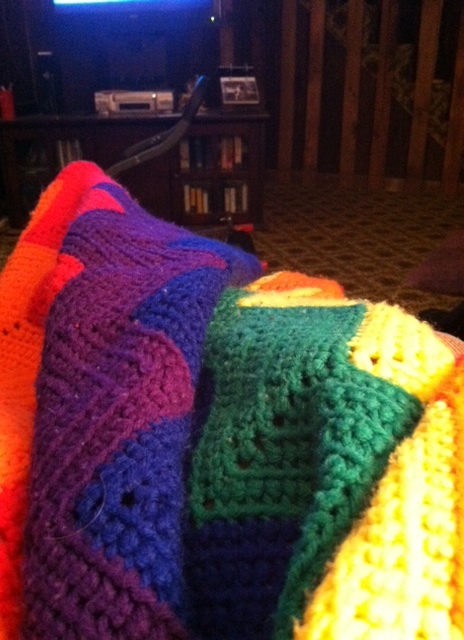 I didn’t have a coat of many colors but I do have a blanket of many colors that my momma made for me. I have included the lyrics of Ms. Parton’s song below along with my story in parenthesis. Dolly and I could be twins, right?! Sitting in the recliner all cozy wrapped in the afghan my momma made for me. On a side note, check out the piece of exercise equipment in the distance. Sitting, gathering dust like an abstract piece of art. I think you’re right about the memories being more tender this time of year. Again with the whole change theme but when fall comes I always tend to become reflective.